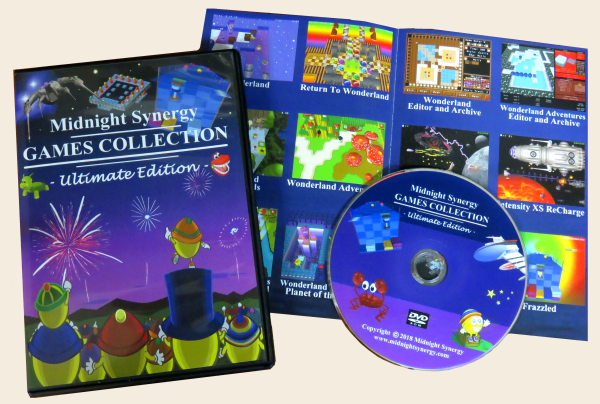 Introducing the Midnight Synergy Games Collection (Ultimate Edition) on DVD-Rom: ten full games, huge level archives, and tons of bonus material. It is a perfect way to pick up our entire games collection at a bargain price or give them as a present to friends and family. 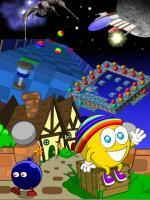 Over twenty-thousand levels created by the Wonderland Community over a fifteen year span! The editor, custom adventures and complete playable hubs, all in one convenient package. The DVD is available right now for an introductory price of just US $34.95, plus shipping and handling for anywhere in the world. That’s over 75% off the individual game prices (and you get the game box and tons of bonus material). To order your copy, click here. Packages are sent out as soon as your order is received (except on weekends and holidays). Packages are sent from North Carolina, USA, and shipping will vary depending on your country of residence. A typical estimate for shipping is 4-7 days (USA), 6-10 days (Canada), 2-3 weeks (Europe and Australia), although shipping times can be less. You also receive an immediate digital download for all ten full games (not archives or bonus content) after your order. I Already Own A Game or Disk, Do I Get A Discount? Unfortunately, no. Calculating individual prices based on a combination of previous game purchases would have increased the handling price on every order. And since our games are available through many different online vendors, it would be impossible to track past orders for anyone who did not order the game directly through our website. To keep things as fair as possible for everyone, we simply decided to charge an incredibly low price to all customers. Even if you already own one of our games, we hope that the ultra low price of the collection will provide you with lots of value either for yourself or as a gift to others. Simply click here to order your copy.